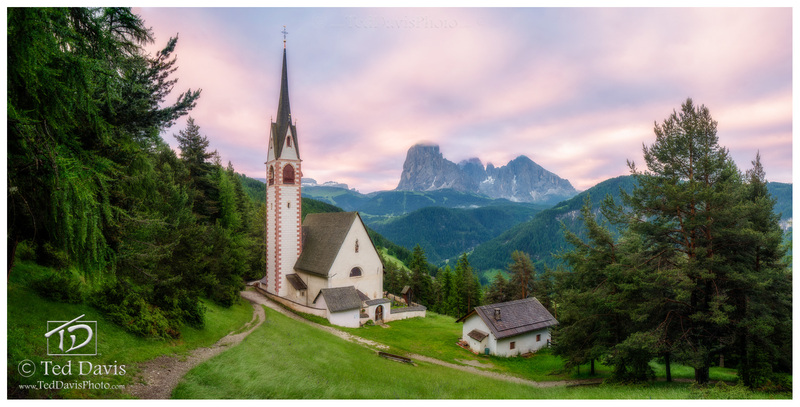 Amidst the beautiful peaks of the Dolomites are small towns often accented with a beautiful church in a mixed style of Italian, German, and Eastern European architecture. Overlooking the valley of Ortisei is San Giacomo, an iconic church in this region with absolutely fantastic views. Morning after morning I trekked up to this beautiful church waiting for a sunrise that would do the scene justice. Finally, on my last day in the Dolomites I was rewarded with the most beautiful, jaw-dropping experience. As the sun began to overpower the lingering clouds, bright lines of pink and purple spun around the peaks in the distance. It was as if the northern lights had descended and began to play amongst the clouds. I stood mesmerized as the scene slowly deepened and the lines slowly stretched and expanded from horizon to horizon. Capturing the enchanting scene in a vast panoramic, I knew this would be one of my favorite shots from Italy. Photo © copyright by Ted Davis.